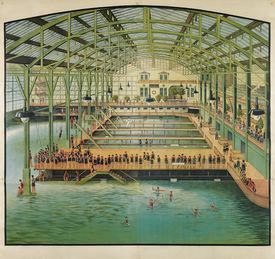 New York—A mammoth auction of Vintage Posters on August 1 set at least six auction records, including a new high price for Sutro Baths. The text-free variant of the 1896 poster, promoting a former San Francisco landmark, brought $23,400. The exhibition for Swann Galleries’ annual summer auction was overflowing, taking both exhibition floors at the house’s Flatiron district premises. Alphonse Mucha’s Times of the Day was the top lot of the auction, selling to an institution for $40,000. Other Mucha works received significant attention from collectors: Bières de la Meuse, 1897, sold for $17,500 over an $8-12,000 presale estimate, and Salon des Cent, 1896, brought $10,000. The sale set a record price for Peter Behren’s Der Kuss, 1898, a color woodcut published by Pan magazine, at $5,000. Other Art Nouveau highlights included Marcello Dudovich’s 1908 design for the Italian department store Mele ($6,500). The auction offered an unusually broad selection of food and drink posters, with sections devoted to Leonetto Cappiello and Luciano Achille Mauzan. The former's Carnaval / Vinho do Porto, 1911, brought $18,750. Manuel Orazi’s Ligue Vinicole de France, 1901, an elegant image positioning wine as the wholesome answer to the modern world’s ills, brought a record $10,625. Ludwig Hohlwein’s Kathreiner Weine, 1913, was purchased by an institution for $4,750. As a firm counterargument to the virtues of a perfectly aged bottle of wine, a group of 20 small-format posters issued by the American Temperance Society sold for $2,125. Wartime propaganda, for which these sales are known, included both marketplace mainstays and surprises. Among top lots were perhaps the two most iconic posters in the world: James Montgomery Flagg’s I Want You brought $10,000, while the anonymously designed Keep Calm and Carry On, a 1939 image from Great Britain’s propaganda efforts in WWII, sold for $12,500. Soviet Constructivist images performed well, with posters by Gustav Klutsis and Nikolai Andreevich Dolgorukov among the top lots ($9,375 and $6,750, respectively). Two posters designed by Arthur Szyk in the 1940s for the war effort, encouraging American soldiers to “Fool the Axis - Use Prophylaxis,” sold for $4,750 and $4,000, new auction records over estimates of just $800 to $1,200 apiece. The next auction of Vintage Posters at Swann Galleries, Rare & Important Travel Posters, is scheduled for October 25, 2018. Swann Galleries holds at least five poster auctions each year and is currently accepting quality consignments for auctions in 2019. Image: Lot 511, Sutro Baths, designer unknown, 1896. Sold for $23,400.